Hey guys! Happy Christmas to those who observe. 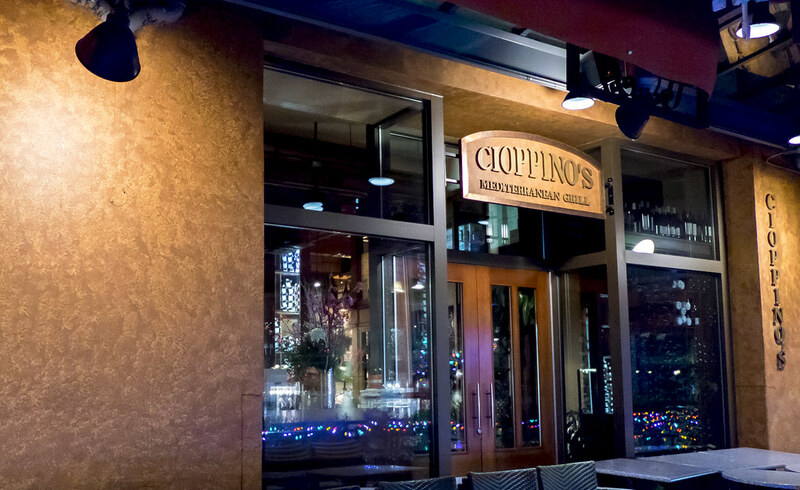 As part of our Christmas celebration, my girlfriend and I made a visit to Cioppino’s, one of Yaletown's highest end restaurants; Vancouver too, for that matter. With a wide variety on the menu, is there enough focus on a great dining experience or should you spend your holiday celebrations elsewhere? Read on to find out. A note on some of these dishes. 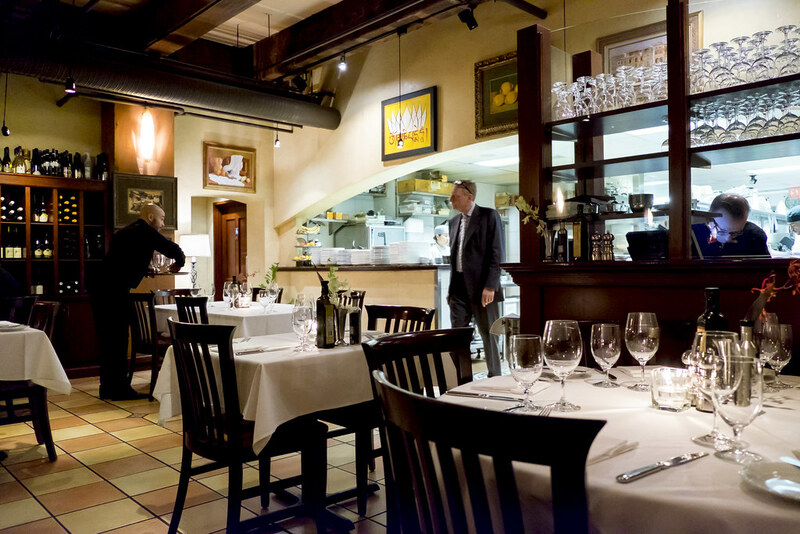 The style of Cioppino’s is the servers present some dishes prior to serving it to individual plates. Since we were sharing, a few dishes were served in this butler-esque way. I’ll note which dishes were served in halves when I took my photo. The Pacific Octopus below was a half serving. 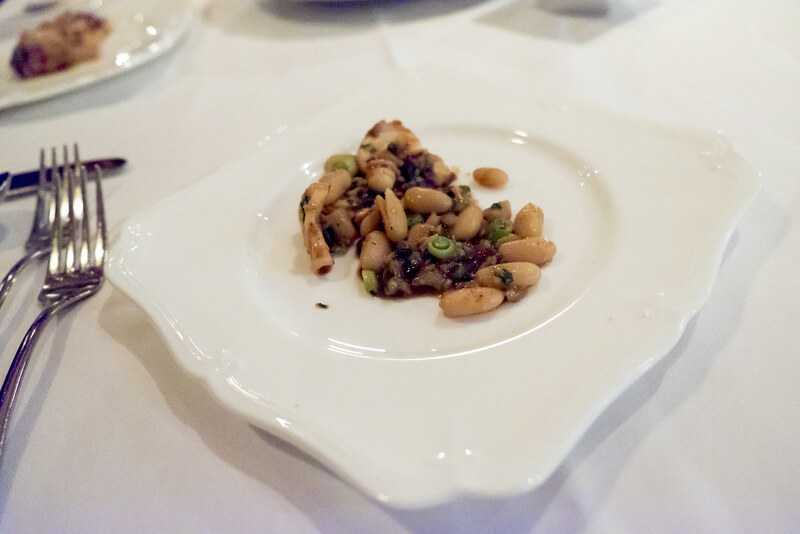 This was incredibly tender and the white beans were full of flavour. The citrus spice was the perfect finishing touch. 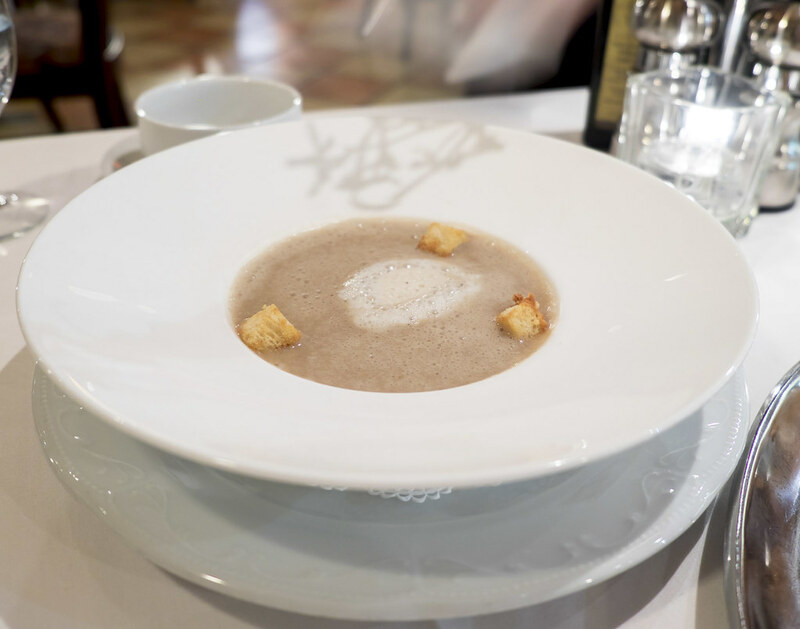 The Porcini and Chestnut Soup was better than what I have read in other food blogs. The soup was thick enough and had chestnut flavour in every scoop. This was accentuated in the globs of croutons. 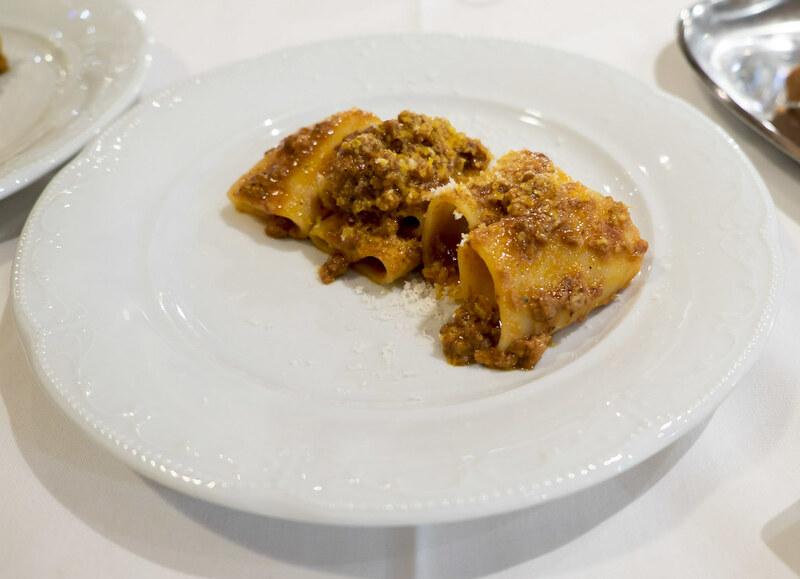 The Paccheri di Gragnano (photographed as a half serving) was a Saltspring lamb sausage ragout tossed in pecorino Romano and served with housemade ring pasta. The al dente feeling here was perfect and the pasta was as chewy as I liked for this shape of pasta. It was a humourous sight watching our server count all the pasta shells to make sure he served the right number to each of us. We had to order the Cioppino; it’s the restaurant’s name! 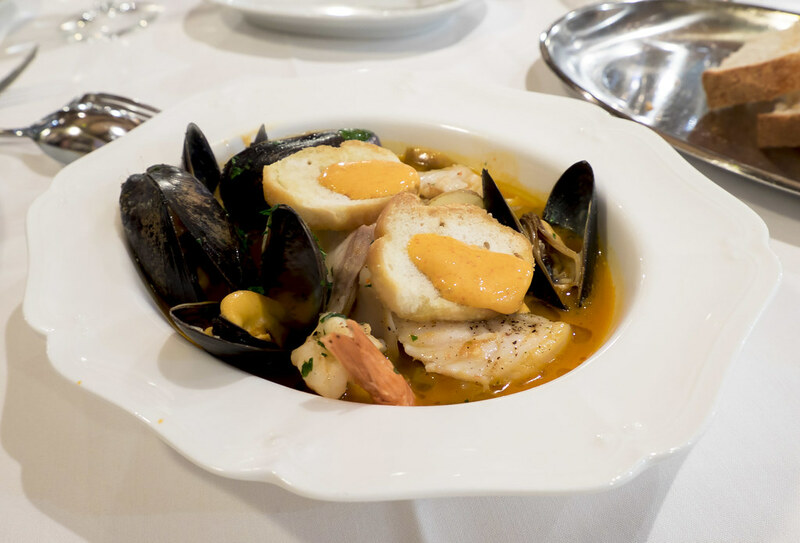 This was a medley of fish, mussels, scallop, prawn, and potato slivers tossed in a spicy bouillabaisse broth. The broth was full of warm spiced flavour but the level of seafood here didn’t amaze me. I found scallops from Cabrito to be plumper. The fish, though plentiful, seems much more abundant than what I consider to be more important (i.e. scallops). At least the mussel shells were all opened, but I think an opportunity to execute a namesake dish was missed here. 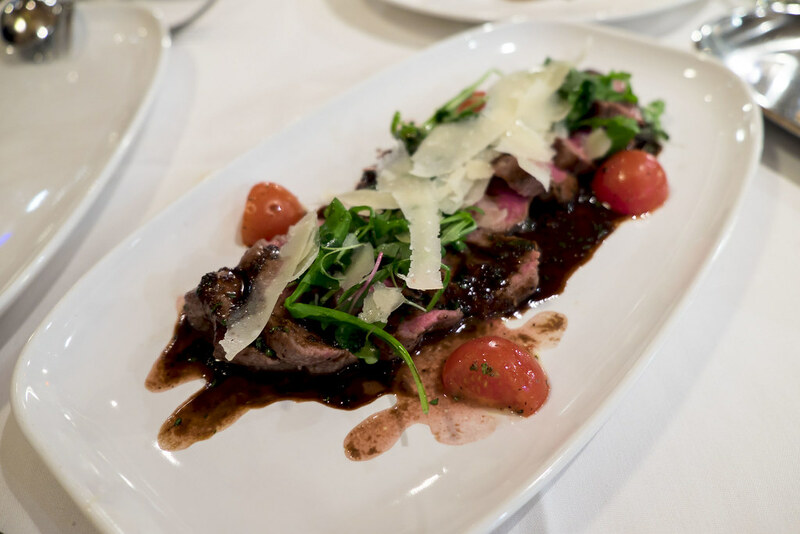 The Rib-eye was an all-meat, no-fat steak cooked whole, sliced, and served with arugula and parmigiano. The parmigiano cheese was very generous and added a pleasant sharpness to each slice of steak (cooked to our liking, medium). The staff delivered on the medium consistency and each slice was a juicy bite. 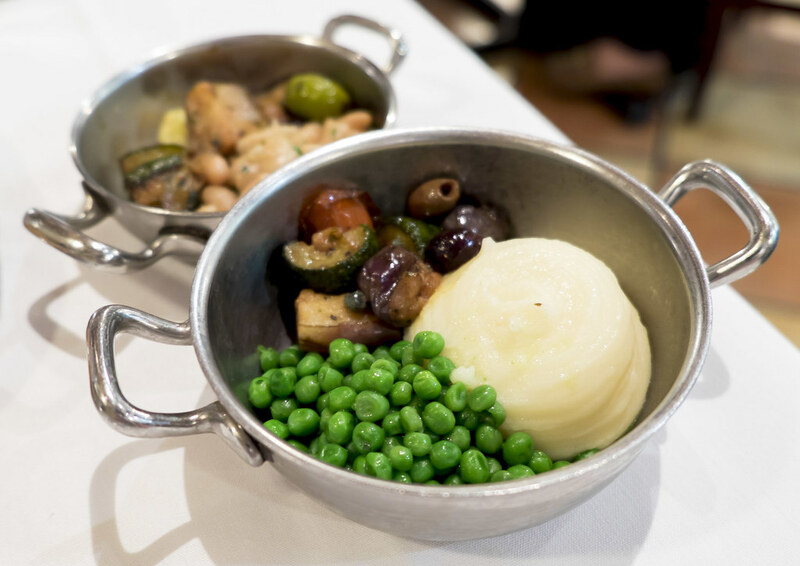 The steak was served with some friends on the side, including mashed potato, peas, eggplant, zucchini, and beans. Needless to say, these were better standard sides than the usual fries or two stalks of asparagus you find at most steakhouses. 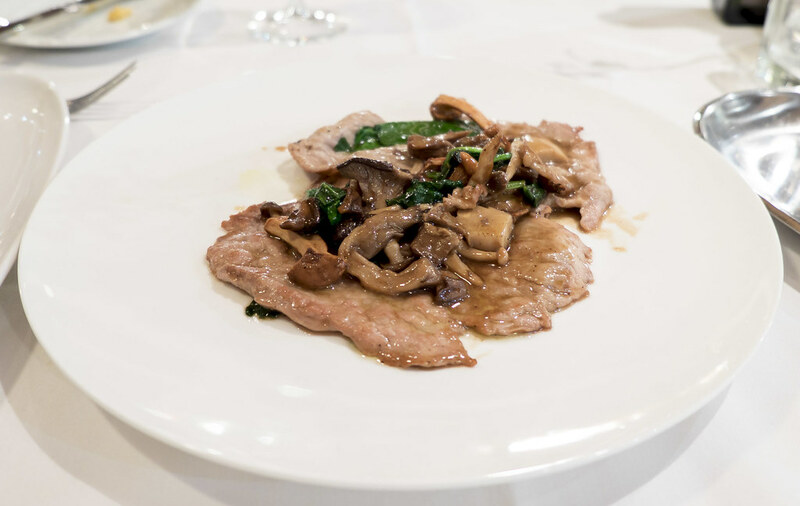 The Scaloppine ai Funghi were grass-fed veal medallions served with sautéed field mushrooms. The thin medallions were cooked perfectly and knowing they’re grass fed is a nice feeling though that should be the standard at this price point. The mushrooms were fantastic and added a needed juiciness to the meat sliced underneath. Last but not least, dessert. We ordered the Panna Cotta off the fresh sheet. This was one thick panna cotta; it basically tasted like a pudding. It was quite sweet. It reminded me of a more compact, sweeter Coconut Cream from Holts Cafe. 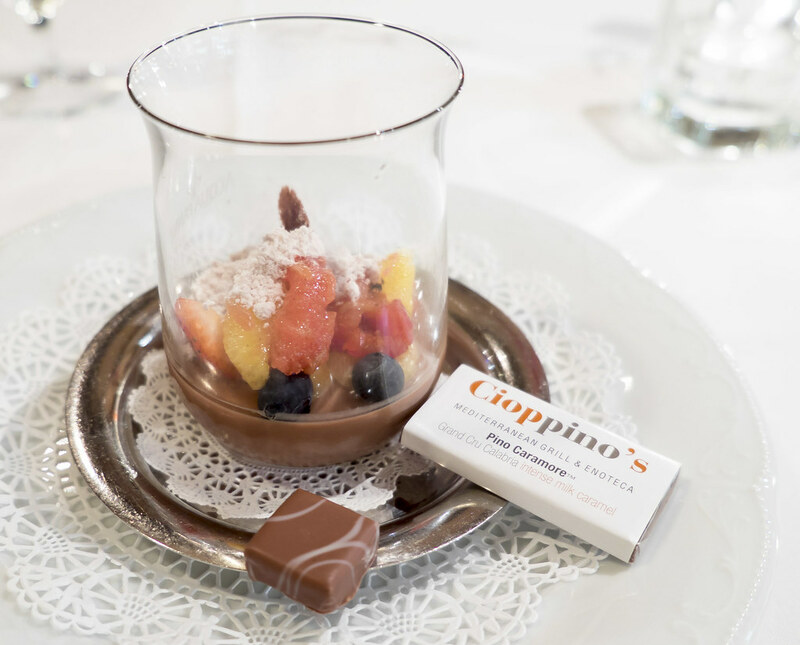 This panna cotta was served with a couple chocolates on the side, but at $16, I’d probably just order a cheaper dessert because I was not ready for this panna cotta. 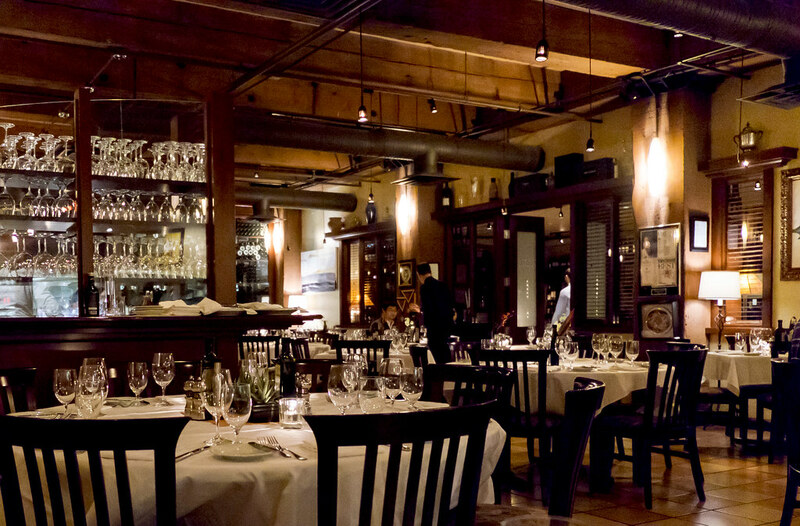 Cioppino’s occupies a large space in Yaletown. The restaurant is split into multiple sections including a couple of dining areas and a lounge. The lighting is dim as expected for fancier restaurants and and the feeling is quite Italian. There are old portraits hung up on the walls and the wine display as you walk into the foyer feels like walking into an aristocrat’s wine cellar. Overall the vibe is quite relaxed and comforting. The menu is quite interesting too. It’s an Italian name but the restaurant is a Mediterranean grill. 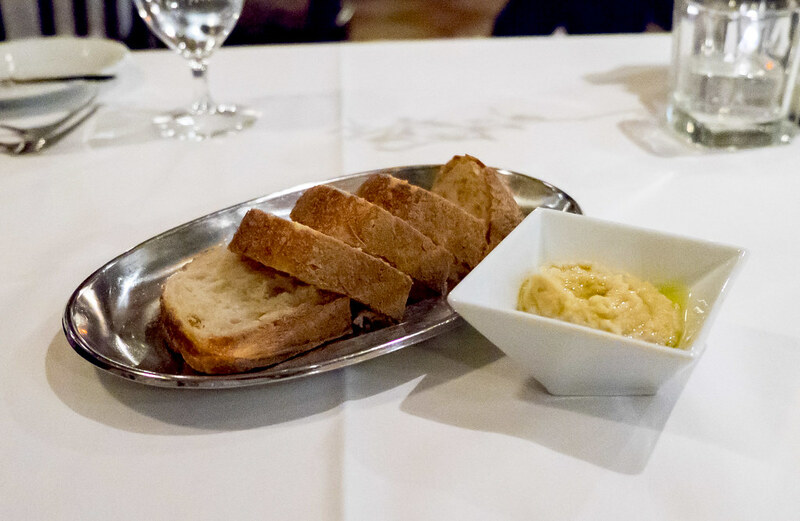 As such, we started off the meal with a plate of bread and hummus. Service from our server was functionally great. Our plates and cutlery were cleared after every single item. There are tons of servers to make you feel relaxed and I never felt I needed to lift my finger higher than my shoulder to find some help. Food came out as promptly as it could with about 10 minutes in between courses, but the entrees came together. Again, as noted above, the servers were ready to divvy up most of our dishes onto our eating plates which never happens anywhere else for me. I had a bit of a cold shoulder moment at the beginning of the meal though. Our server, while explaining the daily features to us, had his gaze fixated only on my girlfriend, and I felt like I was missing the opportunity to be seduced by the menu. Just a small note, but something I noticed right away. Would I go back? Not for the seafood.